You’ve heard how credit cards will take decades to pay off. If you’ve got other debt like a car payment, you’ve probably wondered why a credit card balance of — say $3,000 — will take 20 or 30 years to pay off when your car — which may have a balance of about $25,000 — will only take about 5 years. (Just in case you’re thinking that a car loan with a balance of $25,000 will get paid off faster because it has a larger payment, not so. A credit card with a $25,000 balance would have a monthly payment of about $200 more in the beginning, but would still take almost 37 years to pay off). The reason is because of the way payments for credit cards are calculated, which is quite a bit different than how payments for cars and mortgages are determined. Payments for a car or a mortgage are based on something called “simple interest.” The payment amount is fixed throughout the life of the loan, and is based on an original — fixed — balance. The payment on a credit card is a different animal. Credit card payments are based on “revolving interest” — and on a balance that can change at almost any time (like whenever you use it to make a purchase). The payments for a car loan or a mortgage use something called an “amortization table” to create a “schedule” of payments during the life of the loan. From the beginning of the loan, the amortization schedule determines the total of each payment, and how much of each payment will be applied towards the principal of the loan, and how much will be paid towards interest for the loan. A 5-year car loan will have a schedule of 60 payments. The schedule outlines how much of each of those payments reduce the principal loan amount, and how much will line the pockets of the finance company you borrowed from (a.k.a. interest). The same goes for a mortgage. If you have a 30-year mortgage, each of those 360 payments will have a predetermined scheduled breakdown of what reduces the principal, and what becomes profit for the mortgage company. The breakdown of what’s applied towards principal and interest is “scheduled” and every time you make a payment, depending on what number payment you make, the amount applied towards principal reduction versus interest has been scheduled in advance. The payments made during the earlier period of the loan are usually heavily weighted towards interest. 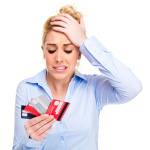 Credit card debt is different. Primarily because the balance can change at any time. So, the amount of the payment, and how much of each payment is applied towards principal and interest, has to be calculated each billing period (each month). Here’s a somewhat oversimplified example of how a credit card payment is applied for an outstanding balance of $2,000 on a credit card with an annual interest rate of 18%. What this means is that – for this specific month and this specific payment – you’re being charged $30 for interest. This leaves $32 to be applied towards the principal balance – the $2,000. After this payment is applied, the credit card company pockets $30 for the interest you’re charged, and $32 is subtracted from your balance, leaving you with a new balance of $1,968. And if you don’t add to that balance between this billing period and the next, the equation would start over again using the new balance to calculate how much you’ll be charged for interest during the subsequent payment period. Another item to note is how the minimum payments are calculated. Typically, it’s a small, single-digit percentage, of the outstanding balance too. In the above example, I used 3.1% to determine what that payment would be. This amount would be stipulated in the contract you signed when you applied for the card. Since both the payment and the interest use the current, outstanding balance, as a basis from which to determine how much the payment would be, and how much of that payment will be applied to interest, your minimum payment decreases from month to month. And you’re – pretty much – always applying the same proportion of your payment to interest. If you use that card between billing periods, the balance and payment will go up, but the same proportions will be in play — percentage-wise. A car loan or mortgage, both use a fixed payment throughout the life of a loan. This creates a scenario where the proportion being applied towards principal grows as the loan matures. But – if you can envision how this works – you’ll see that every month in our example – about 48% of every payment is applied towards interest. And with each payment having nearly half of it being applied towards interest, you can see why credit cards can take so long to pay off. 1. Stop using the card. This means you won’t add to the balance. 2. Pay the amount for “THIS” month – every month – and ignore the “minimum payment” you’re told you can make each month from this point forward. For example, if this month your payment is $62, and you don’t add to the balance, next month the payment will be about a dollar less. But, pay the same $62 you paid this month. This will result in a greater proportion of your payment to be applied towards principal with each subsequent payment. If you allow yourself to be seduced to making those decreasing payments, you’ll continue to lose about 50% of your payment to interest. That’s why it can take you decades to pay off that card. As a financial literacy expert, Anthony Manganiello has helped teach hundreds of thousands of people the truth about debt, credit, and personal financial success. At the DebtFree Academy (www.DebtFreeAcademy.com), he has distilled over a decade's worth or R&D into a simple and easy to understand system. His book "The Debt-FREE Millionaire" was featured on national television and numerous radio shows, and his audio programs, "Great Credit for LIFE," and "The Credit Solution" are Nightingale-Conant best-sellers.